Writer-director Ben Young is back in Australia for a short break and Q&A screenings of his debut feature 'Hounds of Love' after wrapping principal photography in Serbia on Universal’s sci-fi feature 'Extinction', which stars Michael Peña and Lizzy Caplan. IF puts some questions to him. Hounds of Love has had rave reviews since the premiere at the Venice Film Festival and has been invited to screen at 30 film festivals around the world. But the film is only playing on six screens here and has grossed about $130,000. Were you hoping for more or is that the best you could expect with a limited release? It’s done very well on a per-screen average but the disappointing thing is that it is not an easy film to find. People read a review or they see a media spot on TV and think they would like to see it and they look at the big cinemas’ websites and it’s not there so they forget about it. It’s pretty much what I expected. Australian films don’t have a tradition of doing incredibly well in their own country, which is a shame. Congratulations on the AWGIE Award nomination for best original feature film. You are up against Hacksaw Ridge. How do you rate your chances? If I was a betting man I think it would be about 1,000 to one against me. Sometimes the underdog gets up, so the odds may not be that long. I have seen Hacksaw Ridge and it’s a very fine film. Just to be nominated against that is a huge honour and privilege. You wrote the role of the female lead in Hounds of Love for Emma Booth but she turned it down and then only accepted at the very last minute. What happened? I wasn’t very happy about that because Emma has been one of my best friends for about 20 years. Her agent talked her around but by then we had a list of great people we were considering so we asked her to test for it and she genuinely won it. Playing a serial killer was quite a departure for Stephen Curry, who is one of Australia’s funniest actors. Why him? One of my favourite films is One Hour Photo where Robin Williams takes a very dark turn. It is so much creepier in so many ways when a comedic actor makes a dark choice. It made a lot of sense because I had one big doubt, ‘What if the audience doesn’t buy that Vicki (Ashleigh Cummings) gets in the car with this couple?’ So I thought who in Australia would not get into a car with Stephen Curry? The violence in the film prompted some walk-outs. You expected that? I knew some people would react. I saw Snowtown in a general session and some people walked out. In some ways what we suggested was even more confronting. If you don’t know what it is before you buy the ticket that’s a bit strange. You just finished shooting Extinction, the saga of a guy who tries to save his family from an alien invasion. How did you get the gig? The day after the Venice premiere my phone exploded. I ended up with a fantastic agent in UTA and management in LA in Thruline. UTA organised two or three private screenings to which they invited Hollywood big wigs. I got a bunch of offers and Extinction was one of the scripts in which I saw the most potential. The producers liked where I wanted to take the draft and I did have some dramatic ideas about the changes I was fairly insistent would happen. We were all on the same page and it all happened really quickly. 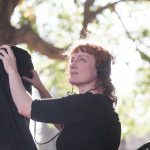 How did you handle the transition from an ultra-low budget Australian film to a studio feature which cost $US20 million? The filmmaking process is exactly the same but it’s just a lot bigger. There are nine producers and there were more assistants on the set than the entire crew of Hounds of Love. You are a lot more supported because they have a lot more money. The biggest learning curve for me was that it is not my film. It is a product that I am being employed to make with the idea of making someone some money one day. It felt somewhere between directing Hounds of Love and directing a television commercial. Dealing with the studio was a lot easier than I expected. But you got your own way on the film you wanted to make? It’s 90 per cent there. There were some things they would not let me do but that was fine and there were other things they did let me do. I was working with really smart producers who had strong arguments as to why. But we did have a three and a half hour phone call about whether Michael Peña should have his sleeves rolled up or down. That’s the nature of working in America. You will do post on Extinction in L.A. Is that your base now? I have a two-year visa so I will be there until Christmas but I will definitely be back for Christmas. There is a film I want to do with an Australian production company in Victoria next year. I am talking to a big American company about a one-for-you, one-for-me deal where they would finance a smaller idea of mine if I did a bigger idea of theirs. It’s a matter of going wherever the people I can work with are. I have to hope that people continue to want to work with me. It can all happen for you overnight and go away overnight.